Not satisfied with simply educating the public on the importance of light in a diamond’s make-up, GemEx engineers created a sophisticated instrument called the BrillianceScope™ Analyzer. 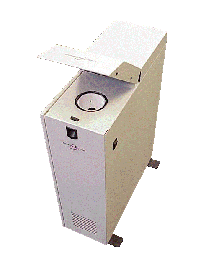 Developed and patented in 1998 with substantial venture and angel funding, the BrillianceScope Analyzer is an imaging spectrophotometer that measures the ability of a diamond to refract and focus light. Using complex optic technology, the device measures three types of light returned through its crown: white light (sometimes called “brilliance”), colored light (sometimes referred to as “fire”) and scintillation (commonly known as the “sparkle”). Superior performance in any one of these light categories will yield a beautiful diamond; the choice of the four C’s is made between the diamond professional and the consumer. The BrillianceScope measures the diamond in a controlled lighting environment consisting of multiple lighting angles. To initiate the evaluation process, the gem is placed within a three-inch integrated sphere with a one-inch hole in which the diamond is firmly positioned. If you draw a direct line from the 2.5-inch ring light through the one-inch hole directly to where the diamond rests, an angle of light is created. After measurements are made at this initial angle, the ring light is repositioned at five different pre-set areas, each one a fixed amount closer to the diamond to create a slightly different angle of light. This movement is achieved via a motion system consisting of a stepper motor attached to a rail, on which the ring light is situated. As one might expect, the accuracy of the measurements relies heavily on the precise movement of the rail. The smallest level of inaccuracy in the motion of the arm can affect the angle of the light and, as a result, the final analysis of the diamond. Thus, repeatability is absolutely essential. Playing an integral role in the motion system’s meticulous performance is a lead screw assembly from Kerk Motion Products, one of the world’s premier manufacturers of non-ball lead screws located in Hollis, NH. The lead screw is integral in each of the five movements that the ring light makes; in fact, it has helped the BrillianceScope achieve a repeatability factor of +/- 5 percent, more than sufficient to ensure the validity of the test results. The Kerk® lead screw was not part of the machine’s original design. In order to create the necessary movement, Schoeckert had designed his own “homegrown” system - an assembly constructed from a U-shaped piece of sheet metal, a 3/16-inch diameter drive screw, and a power nut with two bearings on the end of it. Unfortunately, this first iteration did not perform up to GemEx standards. What’s more, Kerk’s proprietary Kerkote® TFE coating was developed specifically for its lead screw and nut materials for maximum self-lubrication. GemEx used that assembly for a couple of years before turning to Kerk for a slight redesign, after experiencing some minor issues where the ring light cantilevered off of the ScrewRail. The drive nut/bushing would rock on the screw as a result of some extra clearance in the system. Kerk showed GemEx its new RGS® slide with an extrusion that prevented the rocking action, further enhancing the stability of the device and, subsequently, its accuracy. While reading a machining trade publication back in 2002, Schoeckert happened upon an editorial piece on Kerk Motion Products. One thing in particular caught his eye. Kerk subsequently provided GemEx with a ScrewRail® assembly consisting of a drive screw, with a concentric rail, a combination nut and bushing, and a support positioned on the end. On the ScrewRail End Support, Kerk provided 6-32 threaded mounting holes, after which GemEx simply ran the ScrewRail through a base. The Kerk products deliver a wear-compensating unit with low drag torque and high axial stiffness. GemEx evaluated literally thousands of diamonds to determine the range of light performance achievable, and these numbers were directly applied to form the foundation of GemEx’s Comparative Light Performance Evaluation Scales. These scales are simple linear graphs that show how a particular diamond performs in relation to the entire performance range. Using the BrillianceScope, GemEx is able to determine how any diamond rates against the best diamonds in the world. There are currently about 160 BrillianceScopes out in the field, located in facilities where the diamonds are being cut and the quality level of the gems is being established and maintained. Many of them are located in such exotic places as China, Romania, Israel, and Bombay. While GemEx retains ownership of the machines, the cutting facilities perform the actual analysis, which are incorporated into a report that is sent to some of the largest diamond retailers in the United States. These reports – which are the actual product that GemEx sells – help these retailers maintain the standards of their benchmark diamonds. For instance, Kay Jewelers uses the reports for its well-known Leo Diamond®, ensuring that all of the Leo Diamonds it sells match up to the quality standards that have been set long ago. After cutting and polishing the diamonds, the diamond cutters place the gems on the BrillianceScope for analysis. If the quality level is acceptable for that particular diamond brand, it is packaged up and sent to the retailer; if it isn’t, the diamond is reworked until the standards have been achieved. That bodes well for anyone who is considering the purchase of a diamond. In fact, thanks to the BrillianceScope – and its accurate measurement, courtesy of Kerk Motion Products – customers can expect another “C” upon purchase: contentment. Established in 1976, Kerk Motion Products, Inc. is one of the world’s largest exclusive manufacturers of non-ball lead screws. The company, headquartered in Hollis, NH, develops internationally patented, anti-backlash designs and materials that provide high accuracy, unsurpassed repeatability, and long life in a full range of motion control applications. The company’s production facilities include its own injection molding and moldmaking, CNC machine tools, and a quality control department utilizing real-time SPC.